New energy conservation standards for residential air conditioners, heat pumps & package models will go into effect on January 1, 2015. For the first time, federal minimum efficiency standards of certain products will vary, and will be based upon the state (region) the product is installed. Other products will have an efficiency increase on a national basis. Per the Department of Energy, regional federal minimum efficiency standards will apply to residential split system and package air conditioners only. Split system heat pumps, package heat pumps and package gas electric models will have a new national standard. Weatherized (package) gas furnaces will have an 81`% AFUE standard requirement as of January 1, 2015. New energy conservation standards for non-weatherized gas furnaces will go into effect on November 19, 2015 – the current standard of 78 % AFUE for non-weatherized gas furnaces will increase to 80% AFUE on this date. There are no regional aspects to the furnace standards at this time. How will the 2015 Federal Regional Efficiency Standards affect my business? The installation date – not the manufactured date – will be used to regulate compliance of split system and package air conditioner product for the new Federal Regional Standards. There will be an 18 month sell-through grace period for split system and package air conditioner products manufactured prior to January 1, 2015. Non-compliant (13 SEER) products can only be sold and installed in the South and Southwest regions until July 1, 2016 (as long as they are manufactured prior to January 1, 2015). For residential split system air conditioner product built after January 1, 2015, the EnergyGuide label will include a US map that specifies the region where the system may be installed according to the new federal regulations. There will be an EnergyGuide label on the unit and the carton for easy reference. 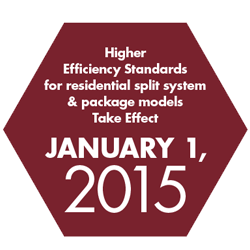 Residential split system and package Heat Pumps manufactured before January 1, 2015 may be be sold after January 1, 2015 until inventory is depleted. All Ruud 360°+1 designed products will meet or exceed the 2015 federal minimum efficiency standards. I’d like to be contacted by a Ruud Distributor to get additional product information, details on how to buy, etc.